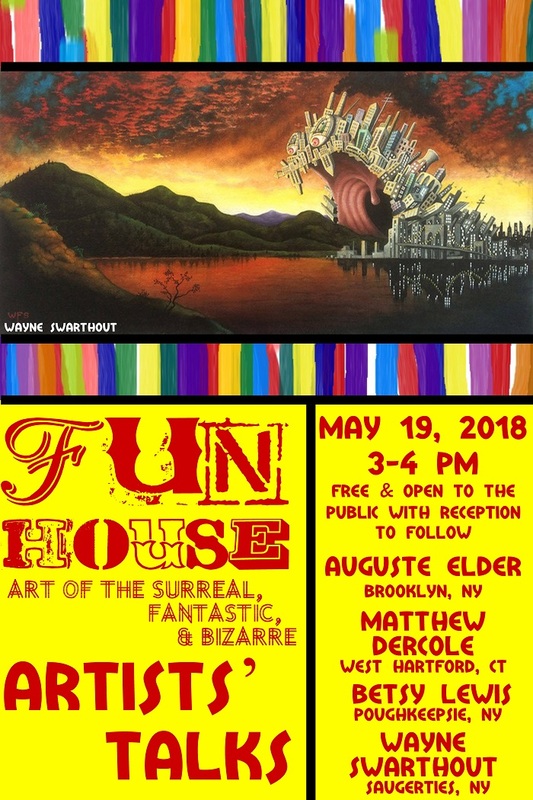 [Poughkeepsie, NY] On Saturday, May 12, Barrett Art Center will open Fun House 2018: Art of the Surreal, Fantastic, and Bizarre, a biennial juried national contemporary art exhibition. A Juried Members’ Show with works selected by Tatana Kellner, co-founder of the Women’s Studio Workshop in Rosendale, New York will also open in the second-floor gallery. Fun House 2018 features paintings, drawings, photography, and sculpture by artists from 13 states, as well as Italy and Australia. Jurors Danijela Krha Purssey, Co-Founder and Editor, Beautiful Bizarre Magazine and illustrator Istvan Banyai selected 75 works from over 960 submissions from the US and around the word. Mid-Hudson Valley artists selected for Fun House 2018 include photographer Jim Allen (Millbrook), metalsmith Betsy Lewis (Poughkeepsie), and painter Wayne Swarthout (Saugerties). Artists from across the region will present artist’s talks about the inspiration for their surreal artwork on two Saturdays during the exhibition. An opening reception for Fun House 2018 and the Juried Members’ Show will take place Saturday, May 12, from 3:00 p.m. to 6:00 p.m. Jurors’ awards with cash prizes for Fun House 2018 and the Juried Members’ Show will be announced at 5:00 p.m., followed by a walking tour of the exhibition with any artists in attendance. The reception is free and open to the public. The exhibition will be on view through June 23 at Barrett Art Center, 55 Noxon Street, Poughkeepsie, New York. Opening Reception: Saturday, May 12, 3 – 6 p.m.
Free and open to the public, reservations not required. Istvan Banyai, Illustrator, animator, and designer, author of children's book, Zoom.